“And who is my neighbor? Join Missionary Oblates JPIC as we stand with other religious communities to take action to support and protect refugees who are forced to flee violence in their communities. As people of faith, we cannot turn our backs on refugee families as they flee from violence. • Ensuring access to education for one million more refugee children. Will you join us in calling for the United States to lead by example? Take action by sending this electronic postcard (e-postcard) to the White House and Members of the U.S. Congress. 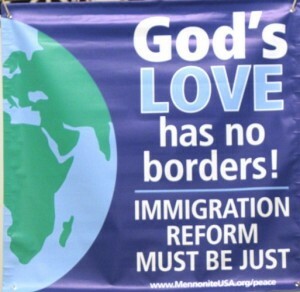 The Missionary Oblates JPIC Office will join the U.S. Conference of Catholic Bishops (USCCB) and its Justice for Immigrants Campaign in celebrating National Migration Week, January 5-11. 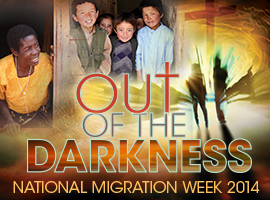 The theme for the 2014 National MigrationWeek is “Out of Darkness”. This theme is an invitation to the faithful community to reflect and recommit in its support of migrants, especially the most vulnerable: the undocumented, refugees, asylum seekers, and victims of human trafficking. These migrants are the most vulnerable and run the risk of violence and exploitation on the daily basis. As part of the National Migration Week celebration, the USCCB Justice for Immigrants initiative will launch a postcard campaign, a national call-in day and a social media day. We encourage you and your local community to use the resources at the National Migration Week website at the United States Conference of Catholic Bishops. Catholics and other people of faith are encouraged to pray and act in solidarity with migrants on Sunday, September 8. On that Sunday, Catholic bishops and priests from all major dioceses across the country will preach a coordinated message supporting immigration policy. The Mass for Immigration Reform action on September 8th is to urge Members of Congress to pass immigration reform legislation that includes a path to citizenship for undocumented immigrants. Intercessions to be used during the Mass for immigration reform. Call on Congress to Pass Just and Compassionate Immigration Reform! Send the electronic postcard below to your U.S. Senators and Representatives and ask for passage of immigration reform legislation in the 113th Congress. Simply click on the postcard below or this “Take Action” link to send the postcard. Go to www.justiceforimmigrants.org for more information. After you have sent the postcard to your Washington, DC lawmakers, forward this message to your email contacts throughout the country and urge them to send the e-card to their U.S. Senators and Representatives. Thank you! Lent 2012 begins on February 22. The Oblate JPIC initiative invites you to join us in prayer, reflection and fasting for refugees and immigrants around the world. This is an opportunity to deeper our faith understanding for the stranger and for parishes to pray for comprehensive immigration reform. 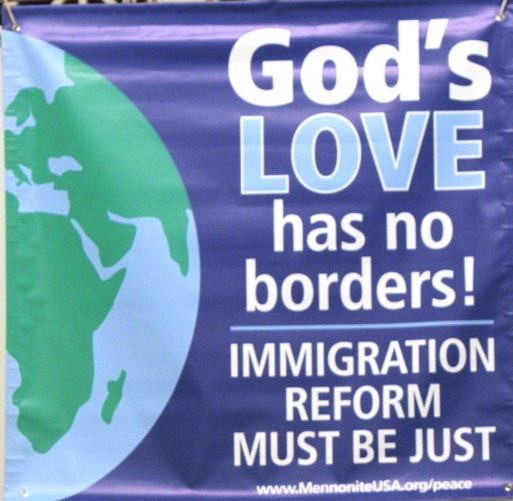 How you will take action in solidarity with immigrants during Lent? You can help Congress understand that people of faith care about the need for immigration reform. Join with others to sign pledge cards at Justice for Immigrants addressed to your Senators and Member of Congress asking them to support just and humane immigration policies. The Oblate JPIC office also has new one-page resource materials on Immigration Reform and Human Trafficking. Oblates can contact our office by email or phone for copies of these reflection materials to be mailed to your community. Our contact information can be found in the About Us section of this website. They are also available for widespread use through the Resources section of this website.